​​Automatically opening and closing landing doors. Lift cars with conveyor belts for auto loading and unloading. Speeds up to 1 metre second, these lifts can automatically transport a variety of goods. As all BKGs, they come with a galvanised steel structure for fast installation with minimum site requirements. 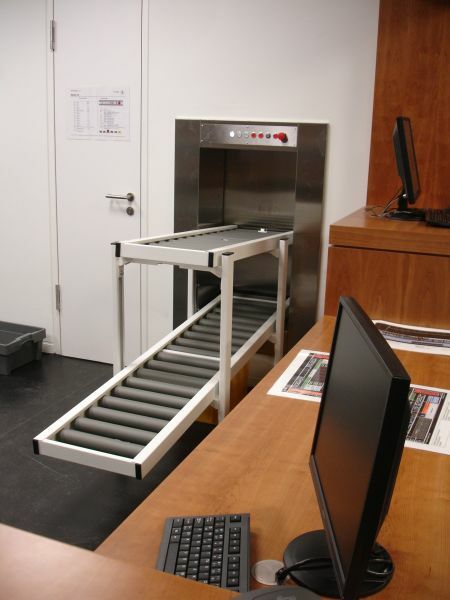 ​Automatic lifts are custom-made to meet our customers’ requirements. Our automatic lifts are the right choice when you need fast material flow rates. Whether its for mail distribution in office buildings, books in libraries or transporting of sterile goods in hospitals and surgeries. We divide our range in semi-automatic lifts and full automatic lifts. Semi-automatic lifts are loaded manually and unload the goods automatically on a roller conveyor in front of the lift door. Full automatic lifts come with a reader in the car that automatically recognises the target by reading a coding strip or RFID chip on the transported goods. Our engineers customise and adjust each automatic unit according to the requirements of the individual project. Based on a long-term experience in this field we designed an implemented a large number of automatic lifts, from a simple 2-stop semi automatic lift to a complete conveying system with 12 combined full automatic lifts. We would gladly support you in designing and emplementing an automatic system for your project. Simply contact us! Other car sizes on request!